On 18 December 2017, the US vetoed a United Nations Security Council resolution that had called for the withdrawal of US President Donald Trump’s recognition of Jerusalem as the capital of Israel. The resolution was supported by all remaining 14 members of the Council. Two days after the vote, Trump threatened to cut foreign aid to countries that voted against the US at the UN. “These nations that take our money and then they vote against us at the Security Council … We’re watching those votes. Let them vote against us, we’ll save a lot,” he said. Several years earlier, the first Bush administration famously pressured governments to vote in favour of the Security Council resolution approving Operation Desert Storm. When Yemen voted ‘no’, James Baker, the Secretary of State, reportedly told colleagues, “[t]hat’s the most expensive vote they ever cast.” The US subsequently cut $70 million in foreign aid. These anecdotes reflect a systematic pattern. In previous research, we and others have found that countries that serve on the UN Security Council get financial favours. They receive more US aid and more loans from international institutions in which the US commands a powerful voice, including the IMF, the World Bank, and UN aid agencies. Countries also receive softer IMF conditionality during their two years of temporary membership (Kuziemko and Werker 2006, Vreeland and Dreher 2014, Dreher et al. 2015). In recent research (Dreher et al. 2018) we asked whether these favours are linked to voting behaviour in the Security Council, what the rewards might be for voting with the US, and the method by which the US could ‘buy’ agreement, given that it would be frowned upon if done openly. To answer the questions, we used an original dataset that comprehensively records Security Council voting data. We estimate that countries that voted with the US in the Security Council also got an increase in US aid of about 40%. Those members that voted against the US, on the other hand, got no more aid while serving on the Council than countries outside the Council. Source: Dreher et al. (2018). This pattern of increased aid is only observable for US allies (see Figure 2). While the US government would not be criticised for giving aid to allies, it might be politically costly to an administration to openly reward non-allies in ways that the US Congress and public could see. Notes: The figure shows the marginal effect of serving on the UN Security Council while voting all the time with the US on bilateral US aid flows for different levels of political proximity to the US (in concert with the 90% confidence interval). 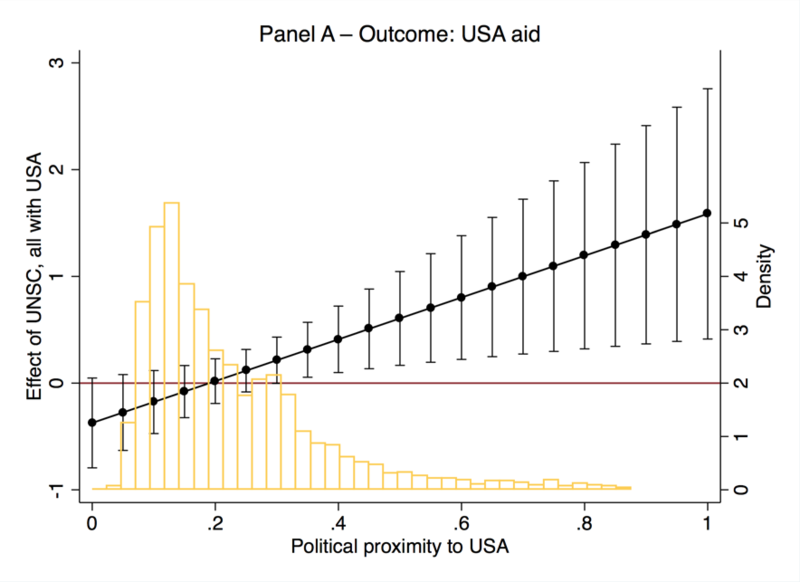 The histogram shows the distribution of political proximity to the US among aid-eligible countries, measured as voting alignment in the UN General Assembly. These payments may be seen as improper. Also, an increase in foreign aid following a vote at the Security Council might damage the legitimacy of the UN, when this legitimacy a key reason for governments to seek Security Council support in the first place. The US public might also frown upon providing aid to a country not viewed as a friend of the US. An historical example suggests that these risks do not entirely prevent the US from buying support from countries of this type. After the collapse of the Soviet Union, the US attempted to influence political developments in Russia with billions in bilateral aid in the early 1990s. In the mid-1990s, these aid packages came under increasing popular pressure in the US because of concerns over the budget deficit, and an unpromising outcome (for US interests) in Russian parliamentary elections. This led to large reductions in US aid in the late 1990s. But when the US turned away from using direct bilateral aid, it started using obfuscated sources of funding. In 1995, the IMF approved a $6 billion loan program. It increased it to more than $10 billion the next year, and to the extraordinary figure of $18 billion in 1998. It is now clear that the US put pressure on the IMF behind the scenes. Boris Yeltsin, the Russian President at the time, said that to get the IMF to commit to these loans “[w]e had to involve [Bill] Clinton, Jacques Chirac, Helmut Kohl, and [John] Major” (Gordon 1996). Apparently, the US exploited its influence on the IMF to provide multilateral financial support when it had become difficult and politically costly to give bilateral aid. 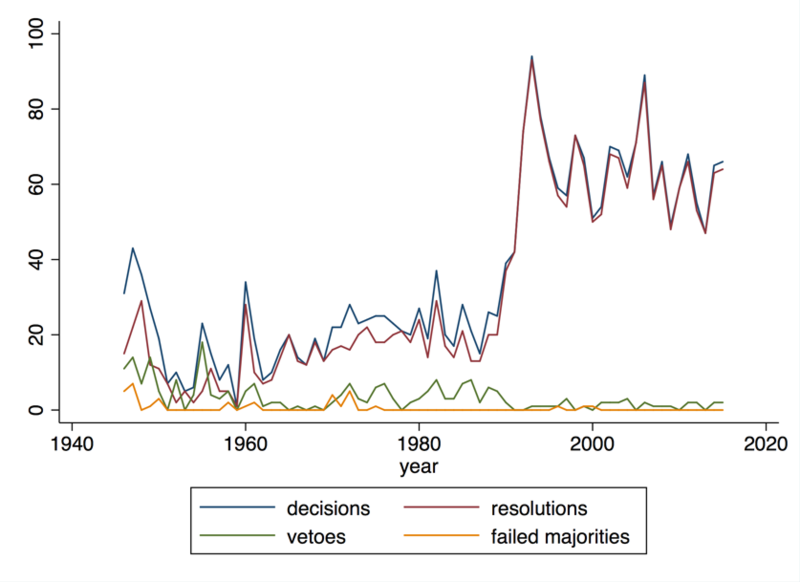 We find systematic evidence that this pattern held when looking at UN Security Council voting data. While allies received increased bilateral aid from the US when they voted for the US position, governments not allied with the US did not. Instead, when these governments voted with the US, there were increases in loans to them from the IMF. Our results suggest that these countries received an increase in IMF loans of about 50%. 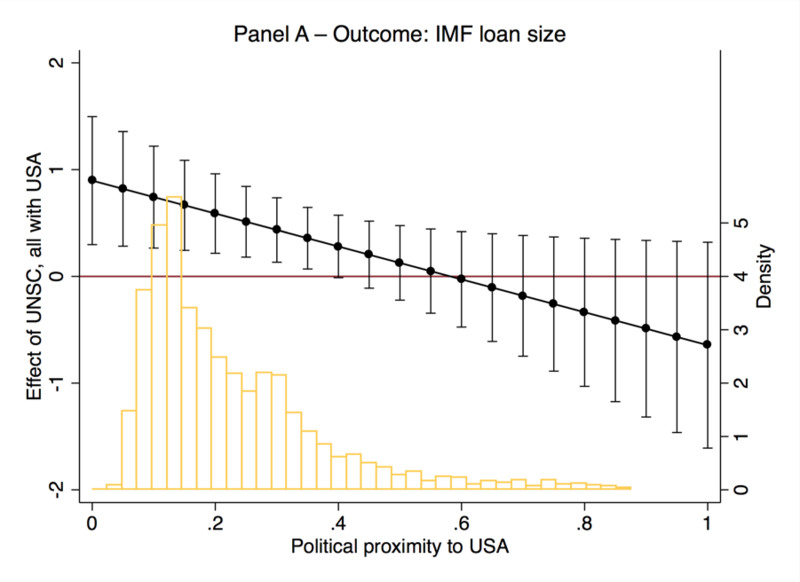 Notes: The figure shows the marginal effect of serving on the UN Security Council while voting all the time with the US on IMF loan size for different levels of political proximity to the US (in concert with the 90% confidence interval). The histogram shows the distribution of political proximity to the US among aid-eligible countries, measured as voting alignment in the UN General Assembly. It may be no surprise to find that powerful countries would be willing to buy influence. Realpolitikhowever, has required different channels for different countries. We see that the practice of buying influence around the world, while perhaps crude, has been nuanced and finessed by obscuring the funding sources. The US may have openly funded its allies, but it hid similar favours to less friendly states. Ironically, the international institutions that the US used for this obfuscation are the same institutions that the Trump administration is currently weakening in its attempt to put American interests first. This entry was posted in Banana republic, Guest Post, Politics, Ridiculously obvious scams on November 24, 2018 by Yves Smith. Ironically, the international institutions that the US used for this obfuscation are the same institutions that the Trump administration is currently weakening in its attempt to put American interests first. Never listen to what a politician says but instead concentrate like a laser on what he does. Trump talks a good nationalist game but what about his actions? Is he undermining the US-led international imperial order? Once again, this article is evidence that he is indeed walking the walk. What’s always amusing is opponents of the US Empire on the good-thinking left are in fact quite clueless about how to dismantle it. They concentrate of the immorality of it all. But in reality the concept of nationalism, which is for the most part verboten to the left, is the very ideology required to fight Empire. Which is why bad-thinking right wingers like Trump are the only ones that will ever succeed in undermining and destroying the US Empire. There is nothing ironic about it. So Trump’s blatant call for “allies” to vote with the US or face an aid cut-off was only tactically aimed at influencing the poor countries on the Security Counsel. It’s strategic goal was to undermine the whole moral legitimacy of the UN by making it blatant that poor country votes are on sale for international aid gimmedats. That is indeed the question posed by Trump – Is the US an Empire, or a Nation. It is an empire. The last remaining19th century empire. Consider its scope: The reserve currencyof the world. Control of vassel stayes, by sanctions, reward of stayes with aid, actually bribes, and with secret police and armed might in a majoroty of counyries. And so we see the truth: corruption is everywhere in the world and wealth and corruption flourish together. Um, it might have helped if the authors had spoken to somebody who knew how the Security Council worked. Most SC resolutions are uncontentious, and a lot of effort goes into agreeing compromise texts. There is seldom a “US position” as such. Far from attempts to influence other nations being hidden, they are usually semi-public, with delegations lobbying for their language, or their position on a particular paragraph. The cases mentioned are extreme ones: most resolutions are fairly well supported from the beginning, if the Secretary General and the P3 are together. There are certainly egregious cases – the 2002 /3 Iraq saga is the best known – but they are quite rare, and in general resolutions are agreed by consensus. The cases you hear about (Syria, Palestine) are precisely those where the system fails to work. Incidentally, Clinton’s visit to Togo can’t really be held against her: it’s standard practice for permanent members to have consultations with non-permanent ones, and her staff would have been incompetent not to have suggested it. What this article reveals is that President Trump believes his governments payments to UN representatives and/or their countries are valuable and therefore merit a duty on the recipient to repay in the way expected i.e. a vote in support of USA. That argument had a soupcon of truth when Bretton Woods still worked and national credit notes, whilst lacking value, represented the determination of national treasuries to maintain their value. That has not been true since 1970s when the Fed lost control of its money issue. It was a time when France shipped a boatload of US paper across the pond and demanded gold which could not be paid and Nixon demonetised. It was also the time the Eurodollar market was created based on dodgy savings in Switzerland beyond the Fed’s control. Some clever economist needs to write the eulogy of Bretton Woods and the collapse of the west’s financial system and make proposals for its replacement. US ends up not ever learning anything of different national viewpoints when it can just buy obedience. The UN worked during the Cold War, and it was about preventing Nuclear War, though now with 9 nations having the bomb I’d expect an apocalyptic riot once one nuclear bomb was dropped on a tank division. Money is one identifier of Unitary power and the bomb is another of multipolar power. The UN needs to change. It needs to not be begging all the time but taxing nations to run the institution whose job is to prevent World War. It needs an army of its own as the biggest main change. It may well be possible for the UN to simply form a Treasury of its own & issue fiat currency to pay its own army, or armed forces that enforce the ban on WMDs. Tanks are the reason for nukes, so it follows the UN needs to offer a Tank treaty first.